Enlarge / Captain Marvel is here, and thank goodness. As much as we at Ars Technica like a given Marvel Studios film, even we can get burnt out by hero-movie fatigue. Quirky heroes face insurmountable odds. Then, wouldn’tcha know it, the heroes surmount them. We’ve seen it before—cheered at the action scenes, smiled at the jokes, forgiven the formula. After so many entries, all burning a path toward mega-events like last year’s boring Avengers: Infinity War, it’s easy to lose sight of something unique to the superhero genre: protagonists who swear to protect the world at all costs. That’s a big ask of any human, whether or not they’ve been granted insane powers. 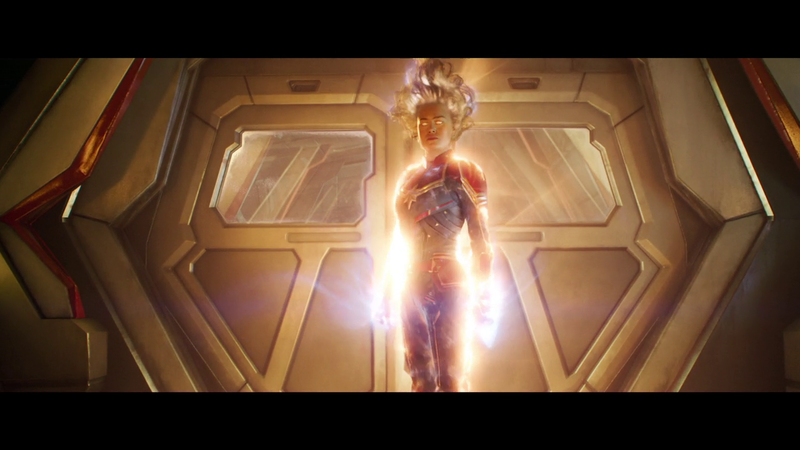 Captain Marvel is a great superhero film for many reasons, but one of them is that it sees Marvel Studios tell its best origin story yet—not just of that one character getting some powers, but of that character discovering her destiny, her reason to get back up when the world tries to shove her down. The character of Captain Marvel may have been granted powers in a supernatural manner, but the film she stars in gets its powers from a rich, human story fueled by delightful twists and impeccable acting. Not Captain Marvel’s best day. All in a day’s work for Brie Larson. Three things appear to factor into Samuel L. Jackson’s very youthful appearance: CGI, make-up, and Jackson’s own impeccable acting. Larson’s character seems way more amused by her antics than Nick Fury is. Jude Law and Brie Larson work out their differences. Brie Larson’s character ups the ante of this conversation. Brie Larson, seen here in era-appropriate attire. Lashana Lynch (left) rises above potential “boring sidekick” status in Captain Marvel with equal parts dialogue and acting. Any review of Captain Marvel must begin and end with Brie Larson, the actor tasked with holding a lot of moving parts together. A badass, a friend, a squadmate, a confused student, a wise mentor, a snarky action star, a terrified child, and a savior: this is how you unseat Robert Downey Jr.’s Iron Man 1 debut as the absolute best in any MCU film. Really, any of the previous MCU films. Better than the Chris Hemsworth’s dripping charisma in Thor: Ragnarok, better than Michael B. Jordan’s tortured villainy in Black Panther, and better than Chris Pratt’s series-cementing vulnerability in Guardians of the Galaxy Vol. 1. Larson smokes them all, as if blasted by two barrels of heat from her hands. When Larson isn’t connecting with her costars in moving conversations, she’s juggling high-stakes comic-book gibberish. (Saying more would spoil some plot points.) But the script does a lot to spread the gibberish wealth among characters, thus letting each of them naturally react to new plot points that emerge. Sometimes, Larson is matter-of-fact in a stern, military-leader way about interstellar craziness, which results in awkward (and intentional) comedy. Other times, she leads characters on by playing dumb or innocent before offering delightfully snappy responses. But best of all is the rapport she builds with actors at the top of their action-film game. Samuel L. Jackson is the obvious shining star in Marvel‘s ensemble, and it’s not just an effects team’s magical combination of CGI and make-up that turn him into a believably younger man. Jackson sells that twist by imbuing his portrayal of Nick Fury with chipper, good-cop energy the likes of which I’m not sure I’ve seen since alllll the way back to Do The Right Thing. Larson and Jackson share the screen for a few lengthy, entertaining sequences, each egging the other on for equal parts humor and action, and the result is the most organic on-screen chemistry I’ve seen in a superhero film in a long time. Annette Bening’s turn as an apparent mentor and overseer suffers the most from over-serious, stakes-setting gibberish, yet it’s a credit to her acting ability that she conveys her material without sounding like an outtake from a Power Rangers episode. She eventually has to plant serious heart into the film’s proceedings, and at that moment, she does just enough to remind viewers of the “Academy Award-nominated” prefix on her resume. Meanwhile, actor Lashana Lynch could’ve been relegated to also-ran sidekick status, but the script affords her enough space to have three roles in the film: friend, mom, and badass. In spite of her limited screen time, she cracks open some waterworks (aided in no small part by actor Akira Akbar, her on-screen daughter and a total sparkplug). Without going into spoilers, both Ben Mendelsohn and Jude Law do a phenomenal job of sacrificing potential acting beats in deference to the larger story. Law, in particular, sees his character turned on its head in one key moment that will have filmgoers roaring, and he rolls with it in seemingly effortless fashion. 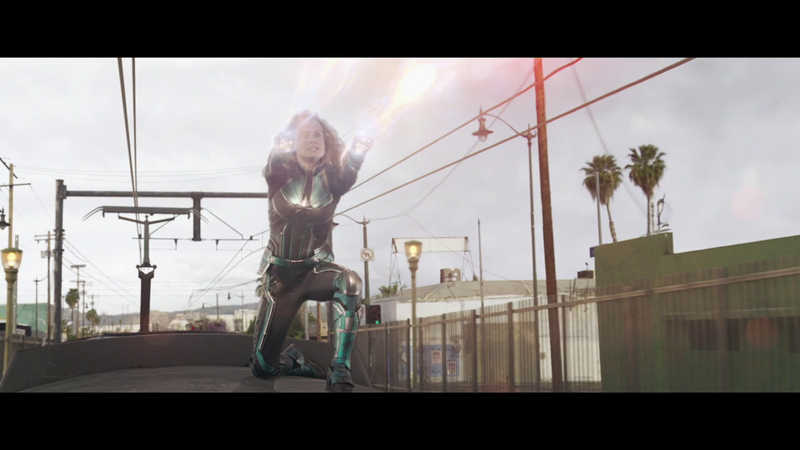 Enlarge / You don’t want to be on the receiving end of that Captain Marvel action, especially when running on the top of a moving train. Notice how I’ve spent a lot of time vaguely praising the film? There’s a reason. The most I’d like to give away about the film’s plot and framework is that it resembles some of the absolute best Captain Marvel comics in recent years, particularly the works of writer Kelly Sue DeConnick. Before going into a Captain Marvel screening, I strongly suggest you pick up trade paperbacks like Higher, Further, Faster, More or In Pursuit Of Flight—not because they are required reading at all (they’re not). Rather, those books’ time-hopping techniques have been paid forward in this film’s script, both in blatant and subtle ways. I really enjoyed noticing the through line as I chomped on popcorn. Your allegiance to various Captain Marvel comic-book timelines won’t necessarily be paid off, as certain events in the character’s MCU origin tale don’t line up. (Instead, series fans will relish certain hilarious references, not to mention a chunk of nostalgia-worthy content.) I was fine with that, as the film opens in somewhat abrupt fashion in order to immediately set equal parts stakes and confusion. What is Larson’s character doing here? What is her purpose? The simple answer of “saving the universe” doesn’t cut it for this script, and Larson’s character has to face off with various friends and foes to figure out an answer to that question that she actually believes in. Gosh, even typing that sentence makes me well up with emotion, thinking about the surprises and delights that Larson unearths for her character, running up to the film’s bombastic conclusion. The biggest criticism I have is that its action scenes simply don’t reach the same surprising heights. The diversity in scenery is absolutely beautiful, with elaborate sets on Earth and elsewhere seeing Marvel’s production designers going all-out to be equal parts sweeping and, er, era-appropriate. But once fists start flying and planes start whizzing, there’s a certain “been there, blasted that” pall that becomes all too apparent. One scene in particular feels ripped out of a lower-budget action film that simply wanted to parody the likes of Halo. But as the rest of my wildly praise-filled text might suggest, that issue is easy to forgive. Captain Marvel is a must-see superhero film. When I told a friend that, he almost instantly replied: well, Sam, how does it rank in your numerical list of MCU films? I paused upon hearing that, thought about it, and ultimately rejected the question. Captain Marvel does things that have been missing from MCU films for quite some time, and the result is a film that feels like an orange in a list of apples. Watching Captain Marvel made me believe in the unique power of superhero stories again, something that I haven’t felt since the first time I read a Wolverine comic book as a kid and saw something raw, challenging, and human in my action-driven storytelling. I’m not a young woman looking for a hero that, for once, resembles me out there; that’s not my entertainment gap. But I am hungry for stories that give power to the powerless—that remind me of the reason my young, social-recluse self flocked to nerd-dom in the first place. For that reason, I look forward to seeing Captain Marvel again.